New technologies and market-based solutions offer more effective ways of dealing with the challenges facing the power supply system. Norway has always spearheaded the deployment of new technologies in the power supply system. In recent years, there have been major technological advances, partly connected with the development of a digital society. These will make it possible to resolve the challenges facing the power supply system more effectively. The power sector is also changing, as electricity is being used in new products and for new purposes. Electricity consumption is becoming more energy-efficient, but at the same time peak loads are rising. The proportion of power produced using intermittent renewable sources is rising. Changes in production and consumption patterns will have major implications for grid operations and for the investments needed in the sector. New technologies and market-based solutions can make it possible to develop a more efficient and flexible system. Over time, this may reduce the need for investments in the grid. The capacity of the system to cope with both short- and long-term changes depends on the physical infrastructure, the ICT infrastructure and market systems. Digital technologies are already an important tool in the operation of the power supply system, for example in advanced control systems in the transmission and regional grids. Operational control systems for the transmission and regional grids use digital systems for monitoring, management and control. Digital systems have also been in use for many years for remote control of electricity production facilities and the grid. Operational control systems allow companies to monitor the status of the grid and production facilities in real time. If a fault arises or there is a power cut or some other incident, operators at a control centre can respond immediately and restore power quickly or correct the fault. Until now, digitisation and integration of operational control systems with other systems have largely been restricted to the transmission and regional grids, but is now becoming more widespread in distribution grids as well. Statnett uses system protection and frequency protection to increase the transmission capacity of the grid, reduce power supply interruptions when there is an outage in a grid component, and prevent local grid collapse. System protection is a generic term for predefined relays that are automatically activated if there is a fault on a power line or at a substation, or if frequency, voltage or current limits are exceeded. System protection includes disconnection of consumption and production. Frequency protection is used to reduce the risk of grid collapse if power production drops. This is an automatic system that primarily switches off ordinary consumption. About 30 % of Norwegian consumption is connected to this form of protection. At present, frequency protection is often manual. As substations in the distribution grid are connected to the TSO’s operating system, it will be possible to develop the use of frequency protection further. By 1 January 2019, all Norwegian households will have had new electricity meters installed as part of advanced metering systems (AMS). These smart meters register electricity consumption automatically hour by hour, and send information to the grid company. The installation of AMS meters means that customers no longer need to take manual readings and report their consumption to their grid company. Frequent, automatic readings will also result in better data quality and more accurate electricity bills. When AMS meters are installed, grid companies will also receive far more accurate information on grid status, which can be used to operate and design the electricity grid more efficiently. AMS provides accurate data on consumption, load and voltages allowing grid companies to carry out more precise grid analyses for planning and operational purposes. A better view of when different parts of the grid are under stress, and how load is distributed, will be an important basis for grid planning. Voltage measurements provided by AMS meters can provide a better overview and improve control of the situation in the low-voltage grid. At present, grid companies only become aware of faults when they are notified by their customers. By then, customers may already have experienced damage to electrical appliances and equipment, and in the worst case electrical fires. Voltage monitoring by AMS can help to avoid this. Interruptions to the power supply are registered, so that the grid companies are able to find and correct faults more quickly. Electricity customers will also notice major changes after the introduction of AMS meters. The traditional system of periodic manual meter readings and settlement on the basis of average prices does not give customers either the necessary information or any incentive to manage their electricity consumption actively. With a smart meter, it will be easier for people to monitor their consumption and fluctuations in electricity prices. Customers will have more information and incentives to use energy more efficiently. They will be able to adapt their consumption to price fluctuations and the load on the grid, and the option of hourly settlement will make it possible to benefit financially. AMS meters also opens up the possibility for a number of additional services, for example related to energy saving and management. Smart meters have an open interface, which allows users to install a range of different additional services. Users can install a communication module that uses real-time or historical data from the smart meter to display electricity consumption. Various options are available tailored to different areas of use and user groups. They all provide information and feedback on electricity consumption and costs. The information can be provided on an in-home display, an app for mobile phones or tablets, or a web portal. Users can install simple equipment to monitor energy use by various appliances in the home. Consumption can be displayed using colours or illustrations, improving people’s understanding of the cost of heating the home, showering or other activities. An app can also be used outside the home, giving people a complete picture of energy use in the home while they are at work or travelling. Push notifications can be used to give customers useful information, for example if someone has left the house but forgotten to turn off the coffee machine. If information is provided via a web portal, it will be possible to give detailed, comparable data on historical consumption. It might also be possible to provide various other services through a web portal, for example analysis of electricity consumption in different periods or estimates of the effect of introducing different energy efficiency measures. Control systems can be connected to smart meters, and send signals and alarms to various electrical appliances in the home. This makes it possible to control lighting and heating, home alarms and other kinds of electrical appliances via an app on a mobile phone or tablet or via control panels in the home. If a control unit is connected directly to the heating source, temperature patterns can be pre-programmed or remotely controlled via a mobile phone. For example, heaters can be set on eco mode at times of day when the house is empty, or remotely controlled if someone will be arriving home earlier than planned. Safety and security systems can be improved using data from smart meters. If systems receive data from several sources, they can more easily detect abnormal patterns of behaviour in a building and inform the owner. Information on abnormal electricity consumption patterns in a client’s home can be important for care services. Thus, data from smart meters can improve the quality of other services. 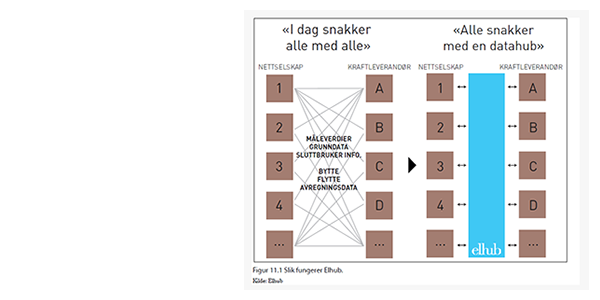 The Norwegian power supply system is flexible. The balance in the system is maintained largely by the large power plants with storage reservoirs. Large end-users also provide flexibility through direct participation in the day-ahead and intraday markets, the balancing markets and other arrangements. The proportion of electricity production based on intermittent renewable sources is increasing and peak loads are rising, which may increase the need for flexibility. It may therefore make financial sense to use a larger proportion of the flexibility that smaller end-users in the distribution grid can provide. With new technologies, demand flexibility from smaller end users can also play a part in maintaining the balance in the power supply system through the intraday, day-ahead and balancing markets. Demand flexibility can also play a role at a more local grid level. At present, the need for more capacity in the distribution grid is largely met by expanding the grid, even though there is often only a shortage of capacity for a few hours a year. It can be difficult for smaller participants to take part in certain markets, for example because of rules on minimum bid sizes in the regulating power market. One solution to this is to establish companies representing a number of households and/or businesses, which aggregate the flexibility, they can provide and offer it in the market. These companies are called aggregators. Legislation currently being drawn up by the EU requires TSOs, grid companies and any future market solutions to encourage participation in such demand response systems, including through aggregators. To offer flexibility, participants must be able to regulate or replace their energy consumption and load demand. New technology will enable end users to play a more active role in managing their electricity consumption. For example, load can be shifted to other times of day without much effect on consumer comfort or on business activities. In future, it will also be possible to set many electrical appliances to respond automatically for example to price signals or the load on the grid. Peak energy demand is an important driver of the costs of grid operation, since it is peak load and not energy consumption that determines how much grid capacity is needed. Allocating grid costs on the basis of the peak load drawn by a customer on the grid can therefore be a suitable and effective approach. This method of pricing, capacity charging, can also reflect the implications customers’ decisions and consumption patterns can have for grid development and investments. Customers with smart meters can obtain more frequent and more detailed information on electricity prices. In addition, the grid companies will be able to use new ways of setting grid tariffs. Hourly measurements from smart meters will make it possible to design grid tariffs based on the customer’s peak load. Peak-load pricing can provide signals about grid capacity and incentives to reduce consumption or move it to another time. This may result in a more even pattern of consumption and reduce peak loads. At present, load metering is mainly used in the transmission and regional grid and for larger businesses in the distribution grid. With smart meters it will be possible to use load metering more widely in the distribution grid as well. This should make household and other smaller customers more aware of the load they are drawing and how this affects grid costs. Customers who even out their consumption patterns or reduce consumption in periods when the load on the grid is high will be able to reduce their costs. Enormous volumes of data will be collected when all customers are metered hourly. To deal with this as effectively as possible, a centralised solution for data storage is being developed. Statnett is responsible for developing a data hub, called Elhub. At present, the grid companies are responsible for distributing metering data to power suppliers, organising changes of supplier, cancelling accounts and compiling data for balance and deviation settlements. Elhub will take over all these tasks, and power suppliers will have easier access to all their customers’ metering data from one site. Third parties, for example aggregators and energy service companies offering monitoring and control services, will also be able to access metering data once they have obtained the end users’ approval. Frequent metering of electricity consumption and the exchange and storage of larger volumes of data will make protection of personal data and data security more important. It is an important principle that customers own their metering data and decide who is to be allowed access to them. The grid companies are responsible for data security relating to smart metering. To avoid misuse of data and unauthorised access to personal data and control functions, the grid companies and Elhub must comply with strict requirements. For Elhub, these include mandatory encryption of messages, a secure access control system and an information security management system. The grid companies must require the communication system for smart meters to be configured in a closed network or alternatively encrypted. They must ensure secure access to critical control functions such as on-off switching, in other words remote control of the electricity supply from the grid company. If smart meters and the operational control system are linked, the smart metering system must meet the requirements of Norway’s regulations on security and emergency planning in the energy sector. The Norwegian Water Resources and Energy Directorate has also drawn up guidelines on smart metering and security, which will be updated. Smart metering systems must have an open interface, allowing commercial suppliers to offer extra services that make use of their capabilities. The Norwegian Electrotechnical Committee and the Norwegian Water Resources and Energy Directorate have developed national recommendations on access to different types of data via the open interface. These are for use when commercial firms offer communication services via an app, display or smart home system that is linked to the smart meter. One recommendation is that the open interface should be deactivated when the grid company installs smart meters, and that electricity customers must actively approve activation of the data flow. As additional services and other opportunities based on smart metering and Elhub are developed, it will be important to ensure the neutrality of grid companies, to avoid abuse of monopoly power.. For example, grid companies and power suppliers will be required to keep separate customer databases from 1 January 2019. The power supply sector is already highly computerised. As digital solutions are used more widely there is a risk of that the number of ICT-related incidents will rise. In addition, the introduction of new technologies and the use of cloud solutions or suppliers abroad may involve security and regulatory challenges. Energy infrastructure and facilities are considered to be critical infrastructure. Companies in the sector must therefore comply with comprehensive rules set out in the Energy Act and the regulations relating to security and emergency planning in the energy sector, which are administered by the Norwegian Water Resources and Energy Directorate. The regulations lay down strict, clear rules on system security, access control and the availability of competent personnel so that that faults and security incidents in operational control systems are dealt with efficiently. There are also requirements for robust communications systems, since many companies rely on remote control over long distances. The most important operational control systems are also required to include redundant infrastructure, which must function even if infrastructure supplied by commercial firms fails. The regulations also require power companies to be able to monitor and control facilities manually if the operational control system is unavailable. The ability to detect and resolve computer-related incidents quickly is becoming increasingly important. The regulations relating to security and emergency planning in the energy sector contain provisions on this, and in 2013, the Norwegian Water Resources and Energy Directorate took the initiative for the establishment of a group called KraftCERT. This is intended to have the capacity to coordinate the response to computer-related incidents in companies in the power sector. Statnett, Statkraft and Hafslund agreed to cooperate on the establishment of the group, which is intended to provide alerts and assistance in the event of major incidents. CERT stands for Computer Emergency Response Team. KraftCERT has been operational since May 2015. A number of energy companies are now members, and the authorities are encouraging more to join. KraftCERT will cooperate with all relevant security organisations and agencies in Norway and abroad to obtain information on vulnerability and threats to power supplies. The development of new and improved technologies for energy storage will allow even fuller use of intermittent energy production. Energy storage can allow fuller use of capacity in the existing grid, reduce the need for upgrades, make seasonal storage possible and allow more use of energy solutions that are independent of the grid. At present, there are few energy sources that can compete in terms of price and efficiency with flexible hydropower. However, international efforts are being made to develop alternative technologies for energy storage. The costs of solar cell technology are being greatly reduced, and batteries are being developed that can make it possible to store energy produced in daylight hours for later use. 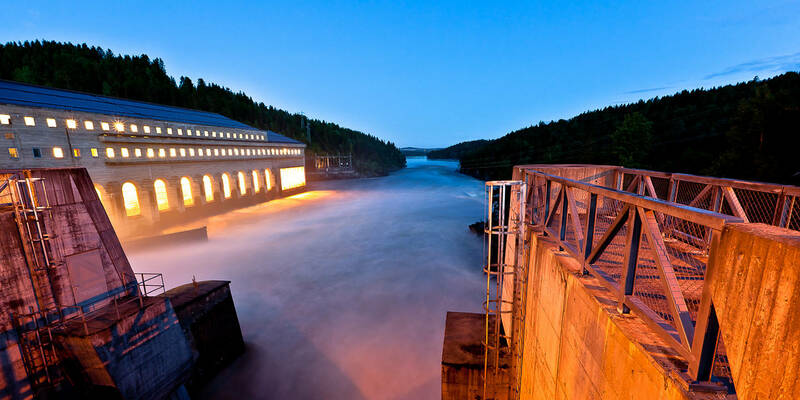 A technological breakthrough may increase the potential of intermittent production, which in turn may affect the value of Norway’s flexible hydropower production. In the long term, new and more efficient battery types may provide a substantial energy reserve. Hydrogen may be an alternative energy carrier where larger quantities of energy need to be stored. Heat storage can also be a useful option when the grid is under stress. Hydrogen storage technologies offer high energy density and short response times. A great deal of research is being done on further development of hydrogen storage. The main challenges that remain are low system efficiency, safety and high costs. Considerable progress is expected in this field in the years ahead, as is the case for battery technologies. In the long term, using batteries more widely may be a way of reducing operational problems in the grid related to the use of power-intensive appliances such as electric vehicle chargers and intermittent local energy production such as solar cells. Batteries may either be a temporary solution, to postpone the need to upgrade the grid, or an alternative to upgrading or expanding the grid. For end users, batteries can function as a back-up solution in the event of power cuts. In addition, they can make it possible to exploit price variations in the grid and store power that end users produce themselves, for example using solar cells. With a battery system connected to solar cells on the roof, it is possible to store energy for later use, and thus reduce electricity bills and the need to sell surplus solar energy to the grid at low prices. The introduction of smart metering for all end users will open up new opportunities for energy storage and shifting load to different times of day.